Earlier this week we commented on how odd it was that leaks were already revealing information about Broadwell, which will follow the June-bound Haswell in 2014. Now we get to catch a glimpse of a future even farther off, where 14nm-based Skylake CPUs will follow the Broadwell in 2015. Like Haswell-E, the chips will support DDR4 memory, although their CPU sockets will be different. 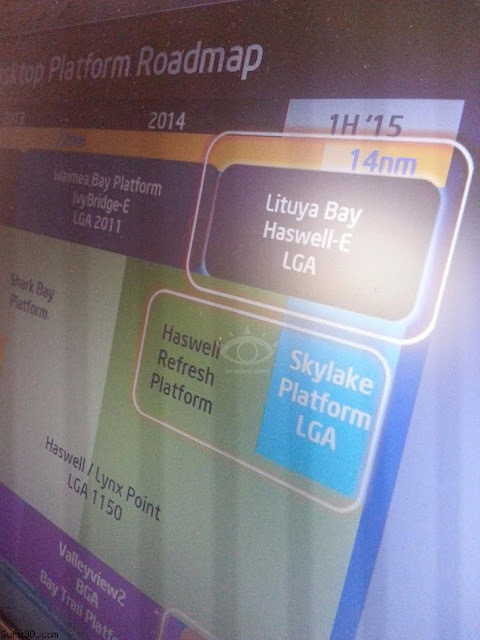 While Haswell-E will use LGA 2011, the Skylake will have a new one. That said, Broadwell-E will probably take Haswell-E's place at some point after the Skylake series' arrival, near late 2015 perhaps, or early 2016. We will have to wait for further leaks, be they documents or photos, to know what else is in store for later years. It will also be interesting to see what AMD will launch during these times.